From the #1 New York Times bestselling author of The 8-Week Blood Sugar Diet and The FastDiet comes a new revolution in fitness. Lose weight and dramatically improve your health with high intensity training--just ten minutes a day, three times a week. Hailed as "a health revolution" by the New York Times, Michael Mosley's FastDiet--also known as the 5:2 diet--gave the world a healthy new way to lose weight through intermittent fasting. 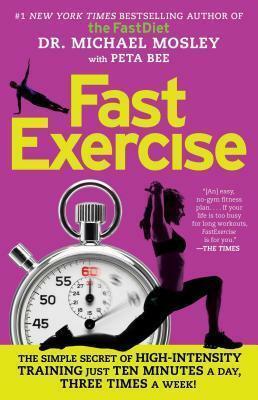 Now, Dr. Mosley addresses the essential complement to the FastDiet--FastExercise--teaming up with leading sports scientist Professor Jamie Timmons and super-fit health journalist Peta Bee to turn conventional wisdom on its head when it comes to working out. Responding to the latest research on high-intensity training (HIT), FastExercise dispenses with the practice of boring, time-consuming regimens, demonstrating that all it takes is half an hour a week to lower blood glucose levels, reduce your risk for disease, help you lose weight, and maximize your overall health. Throughout the book, the authors offer a range of workouts that take just ten minutes a day, three times a week, and can be done anytime, anywhere. Whether it's pedaling at high resistance while waiting for your kettle to boil or holding a plank during commercials, research has shown the extraordinary impact that ultra-short bursts of HIT can have, whatever your age or level of fitness. In addition, Michael Mosley and Peta Bee break down the science behind this radically different approach to exercise and give you the tools to take advantage of the most flexible and efficient method out there. It's a practical, enjoyable way to get maximal benefits in minimal time, short and fast, something that can become a sustainable part of your routine, as instinctive as brushing your teeth. "Fans of the FastDiet report becoming radically healthier by fasting two days a week."